3 Musketeers, that inexplicably addictive, melt-in-your-mouth trick-or-treating go-to, wasn't always just for chocoholics. As it turns out, the iconic bar began life as a strawberry-vanilla-chocolate combo, making it more akin to Neapolitan ice cream than your standard fudgy fare. Yesterday afternoon, a Redditor called Synergy_synner posted a seemingly banal link on the site’s super popular TIL subreddit (aka Today I Learned). 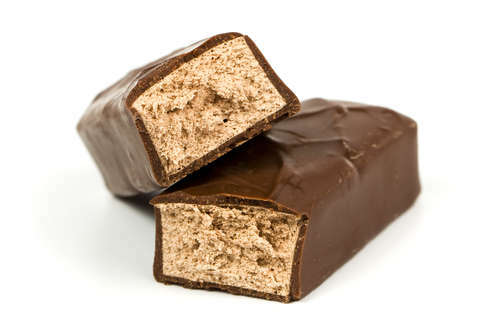 “TIL,” it began, “the 3 Musketeers bar originally had 3 flavored bars in one package (Chocolate, Strawberry, and Vanilla) hence the name, 3 Musketeers.” 20 hours later, Synergy_synner’s tidbit of trivia had racked up over 1,275 comments and had been upvoted nearly 6,000 times. Here's the story: When the beloved M&M-Mars chocolate bar was first introduced back in 1932, it featured a Neapolitan assortment of individual flavors packaged all together. But, as you might remember from history class, the country entered World War II soon after, and wartime restrictions like sugar rationing hit the candy industry hard. Since they couldn’t get enough of the sweet stuff to continue making all three flavors, M&M-Mars had to make a choice. So, in 1945, the candy megacorp decided to axe poor strawberry and vanilla, saving just their precious chocolate from sudden death. And just like that, 3 Musketeers’ current chocolate-covered chocolate configuration was born. So, if you prefer strawberry and vanilla alongside your fluffy whipped chocolate, you can go ahead and put the blame on those pesky Axis powers. Another fun fact? Those three little Musketeers only cost 5¢ a pop when the bar debuted and was marketed as one of the market’s biggest bangs for your buck -- er, nickel. As such, M&M-Mars suggested sharing the deliciously creamy chocolate with a friend. Nice try, guys. Neapolitan or no, this bar’s only big enough for one of us. Meredith Heil is a staff writer for Thrillist. She's got Mars bars, 3 Musketeers -- come through, coupe same color as veneers. Go trick or treating with @mereditto.